Does boredom assault your every day life? Is serious living festering deep inside your basement, routinely following your every step? If so, fear not, dear reader! As August 2015 marks the start of Scott Lobdell, Denis Medri, and Tanya Horie’s newest enterprise: FUN AT DEMAND! Just open up your wallet and go to your nearest comic shop. At long last the best entertainment is at your fingertips. Disclaimer: Results can vary. To QUOTE Eminem: “Trust is hard to come by. That's why my circle is small and tight. I'm kind of funny about making new friends”. After their crazy adventure together in Paris, both the boys decide they need a little breather. And to them, a little breather equates to taking down a whole company involved with illegal gunrunning! Yeah. I know it doesn’t seem like the best way to relax. But hey, that’s how Jason and Roy roll. Roy blew all the money they earned with the Paris’ gig on marketing. He never asked Jason for his permission nor opinion. He chose 555-R-E-D-A-R-S-E as their contact number. Being public on such a large scale has made it impossible for Battleworth to hire them again, due to all the unwanted attention they now have. Without money, or a convenient government agent at their beck and call, the guys have a desperate need to give this whole vigilante for hire business a try. Their first job request takes them to Detroit, and into the presence of a pretty disgusting and creepy fella called, 'Underbelly'. Of course, I won’t spoil how this meeting turns out. Yet, I can say there’s a lot of great moments where both Roy and Jason have their chance to shine, and that this issue ends on such a great cliffhanger, it makes me wish this book were weekly instead of monthly. Lobdell's script still feels very strong, and his handle of the boys is amazing, taking the conceptual idea of the plot into unexpected areas. 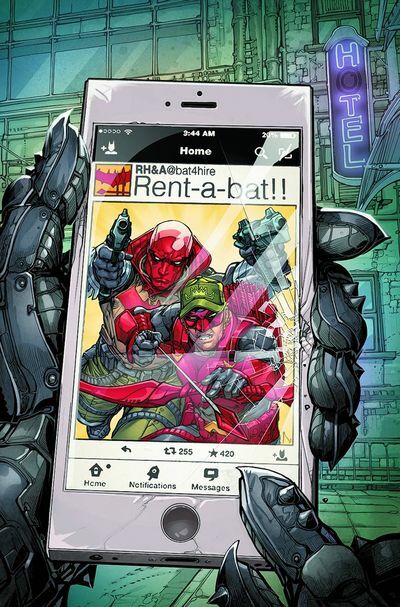 See, when solicits revealed this new direction for the title, there were a lot of complaints about the viability of the idea: the morality of billing people for their help, and the possibility of bad guys hiring them to do their dirty work. Though like the great writer he is, Lobdell tackles this criticism head-on: by having Jason voice the same concerns and weaving a story where this direction not only makes a lot of sense, it's also true to the characters’ motivations. Plus, Underbelly not only gives the title its first long term goal, it also allows Jason’s character to broaden his horizons and consider new ways of helping people, while Roy gets to be a part of something bigger as he has always wished. However, this doesn’t mean the script isn't without its faults. Roy’s characterization is becoming a somewhat problematic element for the title. While his recklessness and general disregard for anything beyond his wishes is a somewhat accurate depiction of someone going through a very difficult heart break, its also becoming stagnant: Roy has started to feel like a kid throwing a tantrum with Jason taking a very passive role to keep him happy. This needs to be addressed very soon, or otherwise Roy will only become a liability for the narrative. I've praised Lobdell’s script a lot, but truth is, Medri's pencils and Horie's colors are the ones whom steal the show. Medri offers very detailed and expressive art where the action filled splash pages are used effectively to convey the full scope of Lobdell's script, while Horie's colors blend perfectly with the art to create a visual treat. In only two issues Medri and Horie have become comfortable with each others style, complimenting each other fantastically. 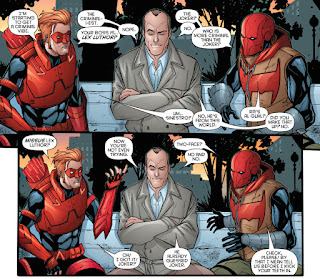 They work so well together that I have no doubt they will soon surpass Rocafort and Blond as the art team that people will think of when talking about Red Hood and Arsenal. I know that Rent-A-Bat is a two man operation, but seeing the little ad Roy cobbled together, and I couldn’t help but think that the intro to the A-Team would be a good match for this book. 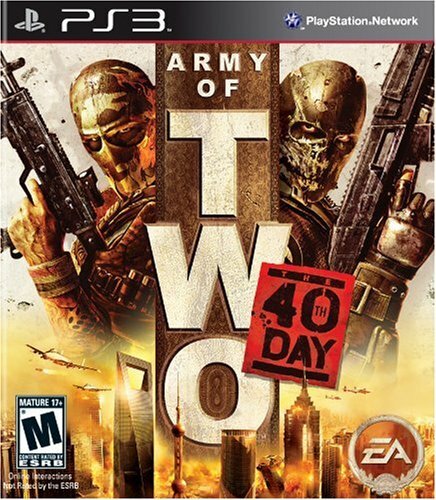 With the overall dynamic between Roy and Jason, the nature of the missions they intend to take on, their vigilante business in general, plus Medri’s knack for depicting tons of action and violence in a very entertaining and somewhat “wild” manner, and I think it best I compare this comic to FPS: Army of Two. Hey! They’re even wearing similar masks! While the series had some very strong offerings on its past two issues, its in this one where the series goes from good to excellent. Everyone in the creative team brings their A-game to deliver an action filled story about two flawed guys trying to make a living by doing the right thing.